With the passing today of Etta James, we lost one of the greats, a performer who crossed genres with ease while never sounding the least bit compromising of her own essential authenticity. 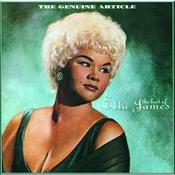 That's what I think of first when I think of Etta James: her authenticity, her "realness." Since I began focusing my work on oral history and documentary film, my appreciation for the quality of "realness" in our popular culture has only grown. Let's be honest; we're a society that's being advertised to, spun to, lied to and otherwise punk'd within an inch of our lives. The growing obsession with reality TV, for example, isn't just an expression of our latent voyeurism; it's a response to our human need to come into contact with that which reveals our own inner lives, our truths. Never mind that reality TV often does exactly the opposite. You have to hand it to Hollywood for at least acknowledging the popular hunger for "realness" - even if they're too often serving it up in it's most reductive form. I don't know if Etta James set out to satisfy any such hunger. More likely she was simply living. James was that rare artist that never departed from her essential truths but instead knew instinctively how to mine them for gold. In giving her pain, longing, lust and sentiment honest expression with each performance, she made the personal universal. It's that skill - and authenticity - that will make her voice one for the ages. Long live the voice of Etta James. Long live Her Realness. Here's an excerpt from Inlaws & Outlaws, our cover of James' signature song "At Last" by the very talented Felicia Loud. Enjoy. "At Last" performed by Felicia Loud. From Inlaws & Outlaws, a True Stories Project film. Written by Mack Gordon and Harry Warren. Pubished by EMI Feist Catalog, Inc. Produced by Eric Lane Barnes & Drew Emery. Used by permission.